Becky’s greatest love has always been to connect with animals from all backgrounds. Before getting her first job working with animals, she volunteered at local animal clinics to do what she loved most. Becky decided to enroll in Animal Behavior College to become a Veterinarian Assistant. 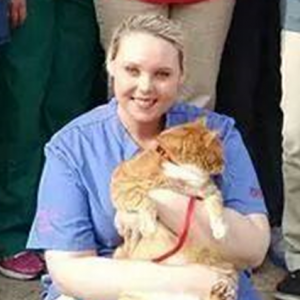 After graduation, She worked at Urgent Pet Care to assist with emergencies and help nurse sick animals back to health. Through her hard work and dedication, Becky was able to grasp and appreciate what it means to help animals. Every “Thank you” she received from clients made her realize why she loves her job and the difference it can make to help animals. Currently, she is enrolled at Penn Foster to further her education to work toward becoming a Veterinary Technician. As a vet receptionist at HousePaws Mobile Veterinary Service, Becky loves being involved with clients and making sure their needs are met. She am honored to be a part of something so rewarding to herself and others. Outside of work, she enjoys going to the zoo and cuddling with her cats at home.